But what prompted me to pick up the blue can was a different marketing campaign, one made back in 1954, in Italy when Nivea was convinced by Italian cycling star Fiorenzo Magni to become the first 'extrasportif' (non-bicycle industry) title sponsor of a professional team. The 50's were a time of enormous and rapid change for Italy. At the beginning of the decade, this primarily agrarian population was pulling itself up and rebuilding from the devastation of World War II. Cycling was the number one sport, followed on the roads, and on the radio, the time of Bartali and Coppi. 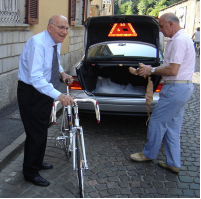 Italian bicycle factories produced about 410,000 bikes per year and about 4 million were on the roads serving as primary transportation vs. only 340,000 automobiles. But the mid to late 50's saw a massive change. Millions poured into newly industrialized northern cities like Milan and Torino in search of better jobs, and their own slice of la dolce vita. Vespas and Fiat Topolinos replaced bicycles as the preferred mode of transport. Bicycle production and use flattened, while the number of autos in circulation rose to 2 million. Increasingly, bicycle manufacturers no longer had the means to support pro teams from the proceeds of bike sales. A few of cycling's top pros could see the future of their sport, and their incomes, and didn't like the picture. They intuitively felt their value they could negotiate from the now financially constrained bike manufacturers who'd controlled pro cyclist livelihoods since the turn of the century didn't jive with the massive popularity they enjoyed in the press and on the streets. They felt underpaid. It didn't make sense. Enter Fiorenzo Magni. 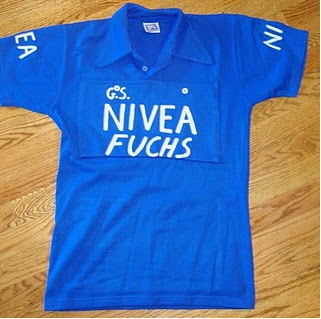 At the end of the 1954 season, Magni convinced Nivea - at the time a woman's face cream brand - to co-sponsor a team with the Swiss bike manufacturer Fuchs, launching the extrasportif commercial paradigm into orbit. Quickly aperitif (Carpano, Cynar, St. Raphael), household appliance (Ignis, Salvarani), food (Molteni) and even espresso machine (EMI, Faema) brands jumped on the cycling sponsorship bandwagon. A professional sport on the ropes was saved, but it was Magni, and Nivea who started it off. Magni was an ironic choice of spokesperson for a woman's face cream brand - and it made many chuckle at the time. The rough-hewn Magni was known as the colossus of Monza, the 'third man' of Italian cycling in the 1950's. 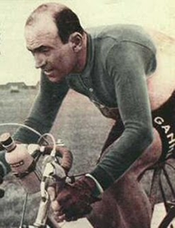 A tough Tuscan born in near Prato, Magni turned pro just after World War II. And while all Italy swooned over the exploits of Coppi and Bartali, it was Magni who was the only one who really ran them close. His first of three Giro d'Italia wins in 1948 was not without some controversy. He'd defeated Fausto Coppi who late in the race withdrew his Bianchi squad in protest, claiming Magni was getting too many pushes by supporters in the mountains. Sour grapes? The Italian "Lion of Flanders"
In April of 1949, in search of adventure beyond the Italian border, Magni packed a cardboard suitcase, grabbed his wooden rimmed Ganna bike, and jumped on a train to Ghent. 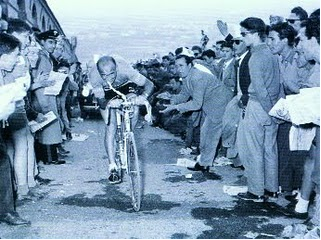 For the 1950 Tour de France, Magni was in the form of his life. Leading the Italian 'B' (cadetti) squad, he took the maillot jaune. During a hotly contested stage in the Pyrenees, Italian 'A' team leader Gino Bartali was brought off on a climb by a spectator. A fracas ensued involving partisan French supporters. 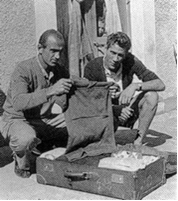 Bartali later said someone pulled a knife on him. That night in the hotel, Bartali the eternally fired up brontolone (grumbler) quit the race and used his god-status to insist on withdrawing all the Italians (including Magni's B team) as well. Magni took his yellow jersey and got on the train to Milan with the rest of the Squadra. To this day, many believe the shrewd Bartali knew he couldn't beat Magni that year, and wanted to ensure if he couldn't win the Tour, then no other Italian would win it either. Magni's answer was to let his legs do the talking, taking Tour of Flanders and Giro d'Italia wins in 1951. By 1955, Magni was in the twilight of his career. In the Giro d'Italia that year, a young Tuscan named Gastone Nencini held the leader's Maglia Rosa with until just a few days to go. But during a rainy stage from Trento to San Pellegrino, Nencini flatted while in the break with Coppi and Magni. No chivalry this day. The two old rivals looked at each other, realized that at such a late point in their careers, gifts like that wouldn't come often, and decided to put the young upstart in his place. They piled it on. Nencini's pursuit was for the Giro. Two vs. one. As Nencini put it later, "They were riding the Baracchi trophy (a 2 man time trial), I was riding the Grand prix des Nations time trial." 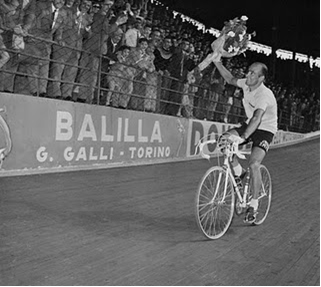 At the finish, Magni snagged the Maglia Rosa and took his third Giro d'Italia win over the young upstart Nencini, who'd have to wait until 1957 to get his own Giro victory. The next year was to be Magni's last Giro, and although he didn't win, it was arguably his bravest performance. He crashed in stage 12 and broke his left clavicle. Just like Tyler Hamilton in the Tour 47 years later, he refused to quit. The immediate problem: Getting through a steep hillclimb time trial the next day. Before the stage Magni tested riding up the steep climb to San Luca outside Bologna. It was no good. He couldn't pull on the bars, or even keep the bike going straight. But his mechanic had an idea. He pulled the inner tube out of an old tubular, tied one end to the stem, and let Magni hold the other end in his teeth to pull against for some extra stability and leverage. 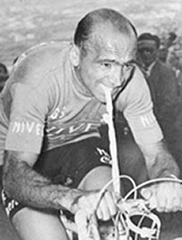 Bit in the teeth so to speak, Magni got through the stage, providing cycling with a lasting iconic image of perseverance and grinta. But wait, there's more! This 1956 Giro was the year of the famous freak blizzard during the big Dolomite stage to Monte Bondone - the stage where the great Charly Gaul came from minutes behind to claim the Giro. 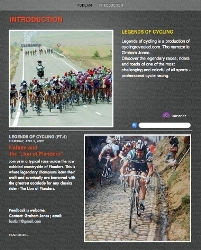 Who also excelled on that apocolyptic day to finish the Giro second behind Gaul? You got it: Fiorenzo Magni, broken clavicle and all, in a Nivea jersey soaked with rain and snow. 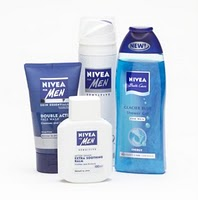 No cosmetic face cream powder puff. Just one tough customer. And Magni was as smart as he was tough. At the end of his career, he started an auto dealership in Monza that's still successfully going today. 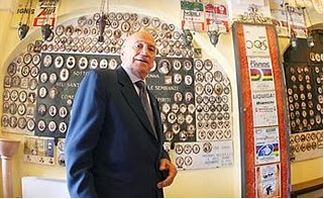 As a 'senior senator' of Italian cycling, he helped raise funds and led the organization of the new cycling museum that lies at the top of the Madonna di Ghisallo climb on Lake Como. On Dec. 7 this year, he'll be 90 years old, and is still going strong - a fixture at the races and celebrations he still attends. I'll leave this post with two more interesting anecdotes about Magni. First: Not many know he was the guy who launched the career of Ernesto Colnago. Young Colnago had his own workshop... one day Magni stops during training with another pro who knew Colnago. Magni was having leg pain. Colnago's eye noticed the cottered cranks out of alignment. With a few expert strokes of his file, Magni's leg pain was cured, and Ernesto was suddenly ordained assistant team mechanic on Nivea, assisting the great Faliero Masi. Next time you see a brilliant carbon fiber Colnago, know that it all started with Magni and a filed cotter pin. Alfredo Martini, director of Italian national team who led Moser, Argentin and Bugno to world championships was a friend of Magni as a young Amateur in Tuscany. In their debut race Martini was 1st, Magni 2nd. Today, Alfredo often uses Magni as an example of the benefits of training in lower gears. 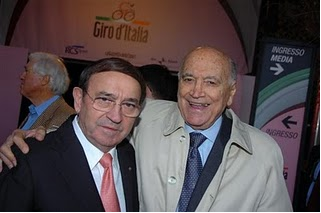 In Bicisport a few years ago in an interview he was lamenting the fact that Ivan Basso was always pushing (too) big gears and told a the following story: "One time Fiorenzo Magni and I met up in Prato to go for a ride. Magni always went training in a 49x21 (i.e. 39x17, 42x18) but that day he'd mistakenly taken a wheel with a 20 cog. He insisted we ride back to his house and change the gear to the 21 before he'd go training..."
I'm proud to have a replica Santini Nivea jersey in my collection. It was one of a few old team jerseys I own that were made for and used in filming the RAI made-for-TV film 'Il Grande Fausto' back in 1995. Magni matters. Check out Bill McGann's great 2006 interview with Magni here, and another by Dave Moulton here. SPECIAL NOTE: As always pour a pint of your favorite Belgian Beer and join Eddy O at the "internet wielercafe" Flandria Cafe!! !